Writing on Facebook, Nicolas Derely explained that he was skiing with his family on January 2, when his son’s friend - named as Emmanuel De Bellavoine - began complaining of knee pain and injury. The group was near the Anterne Pass (La Pointe d’Anterne) near Chamonix when Mr De Bellavoine ran into difficulty, and there was enough phone signal for Mr Derely to call for emergency help. 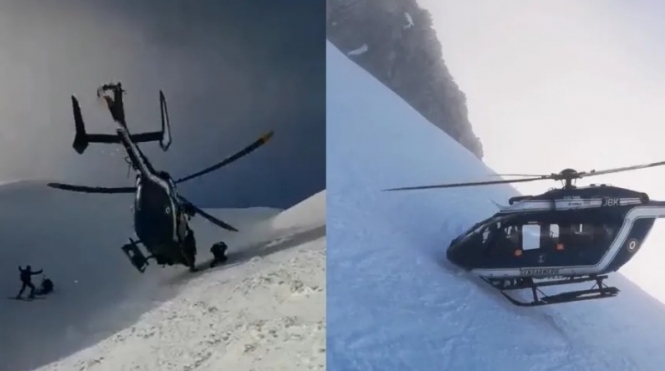 The gendarmerie rescue helicopter pilot has since been praised for the dexterity and precision of his landing, managing to drop off an emergency service team while touching just one helicopter ski on the mountainside, in a move named “a skate support”. Named as Lieutenant Jean-François Martin, the pilot is an experienced flyer with six years of experience in Chamonix, and over 5,000 hours of flying practice. He was able to hold the helicopter securely in place, with the rotors and body of the helicopter hovering mere centimetres from the slope, while emergency staff disembarked safely. Mr De Bellavoine received first aid care first, before the helicopter returned for a second time to airlift him to hospital in Chamonix. Yet, his flying skills have been praised worldwide, with the video published on numerous specialist skiing websites and prompting a flurry of positive comments on social media.